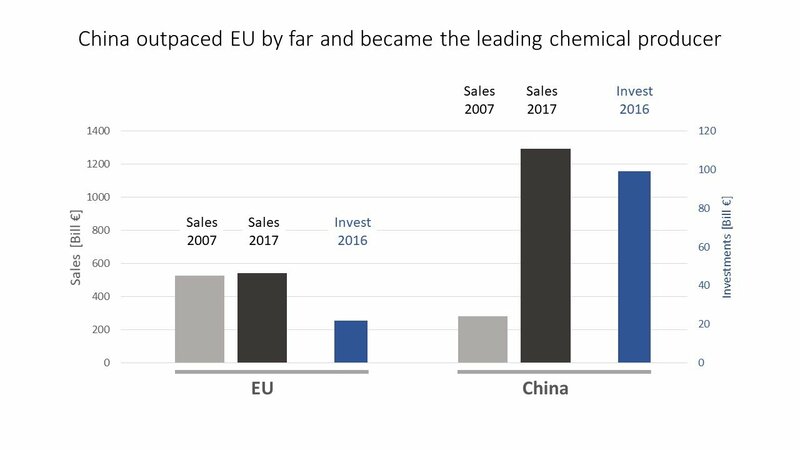 The chemical industry in China has seen enormous growth over the past 10 years, outpacing the EU by far. 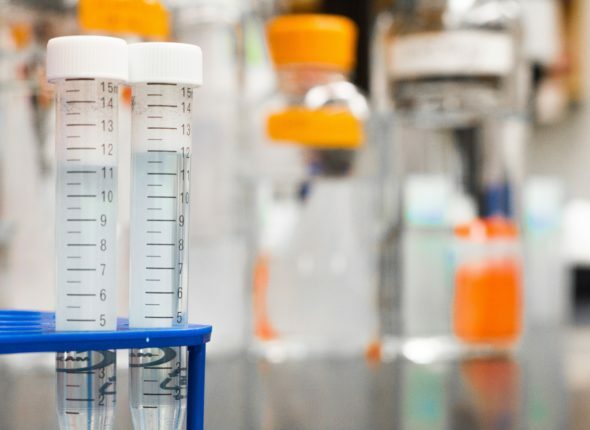 Currently, the Chinese government is driving structural changes, which include pushing into the specialty chemicals markets. Will the German chemical industry be able to compete? The Chinese leader has stated a clear plan to dominate advanced technologies by 2025, moving from ‘following the leader’ to ‘taking the lead’. Looking at the chemical industry, this statement is already outdated by far from a volume point of view. From 2007 to 2017, the Chinese chemical industry increased their sales by an average of 10.7 % per year from €280bn to €1,290bn. This increase corresponds to 83% of the global growth of chemical sales in these ten years. Meanwhile, the Chinese sales volume in chemicals is as big as the sum of the four followers EU, USA, Japan and South Korea. But in line with the plan, there are also structural changes on the way. Driven by the government and the expectation to solve dept and overcapacity issues, a merger of the two big companies Chemchina and Sinochem is reported to be finalized, forming a huge company with appr. €120bn turnover and more than 200,000 employees. Acquisitions of western companies like Syngenta, Krauss Maffei Group or Pirelli enables access to current know-how. A ban for further growth in the coals-to-chemicals industry is enforcing a technological change. Exxon mobile is planning to build a new 1.2m tpy Ethylene cracker together with a LNG terminal. BASF announced two big investments, one of them a new ‘Verbund’-Site with a planned investment of €8.7bn as a fully BASF owned entity, enabled by released regulations for foreign direct investments. This adds to the attractiveness of a huge market, still growing by 6% per year. The new investments will foster the plan to switch from a commodity to a specialty chemicals focused industry and to drive further growth. For 2030, China is expected to cover 50% of the world’s chemical production. China – the spectre of the German chemical industry? The chemical industry is Germany’s third largest sector. Although China’s competitive advantage is decreasing due to rising costs for labor and environmental protection, the country is rapidly becoming a strong competitor for the German chemical industry. According to the recent CHEMonitor survey conducted by CAMELOT Management Consultants in cooperation with trade newspaper CHEManager 86% of German chemical managers rate China’s chemical industry as being of ‘high’ or even ‘critical’ importance as a competitor of the German chemical sector. The rapidly growing expertise and competitive edge of Chinese firms is primarily demonstrated in terms of innovative, technology-oriented topics, which are implemented as bold experiments. Accordingly, 62% of study participants say China’s chemical industry has a higher level of expertise in e-commerce than its German competitors. 23% of those polled rate Chinese companies as more innovative, while 16% consider China to be more competent in the field of robotics. So China is definitely catching up quickly in many important areas. German chemical companies are therefore encouraged to act – if they don’t want to be left behind. The full CHEMonitor survey results “China – today and tomorrow” (German language) can be downloaded here.